Today is a special day, it is Mimi’s birthday. 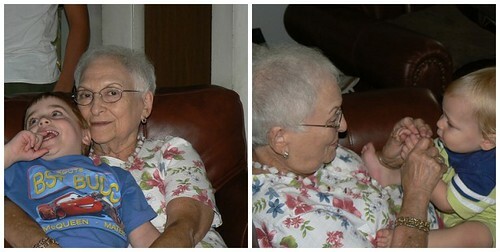 As I have mentioned before, my boys are extremely close to my grandmother. They see her as often as possible, love to visit her apartment to have chicken soup with matzoh balls (and other goodies), and more important to play and snuggle with her. JSL still loves to sit on her lap where she will sing him to sleep. 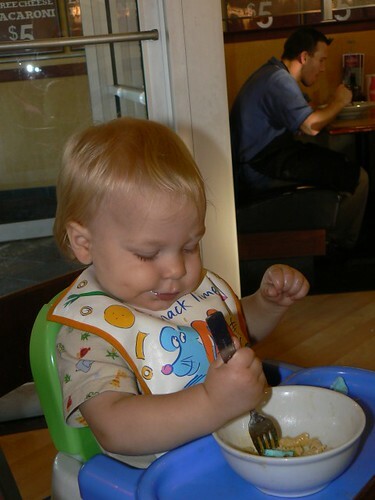 Yesterday night we went out to dinner to celebrate Mimi’s birthday. Much to our surprise there was a special someone at the restaurant. It was none other than Mr. Twisty! When Mr. Twisty heard that it was Mimi’s birthday he was very careful not to ruin the secret. He did not want to bother other people at the restaurant, so he made her a very small birthday crown. Here it is on Mimi’s head. We all had a lot of laughs thanks to Mr. Twisty. He also made something special for NHL. 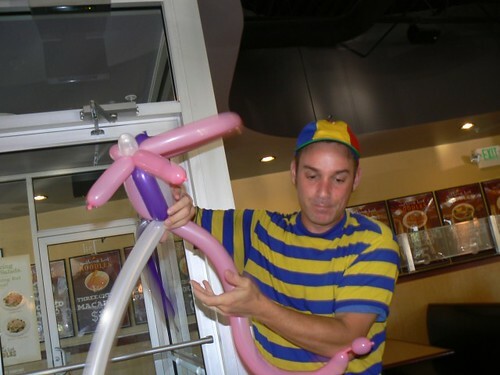 NHL did not even need to hear the list of possible balloon creation. He immediately asked for a lion. ROAR! 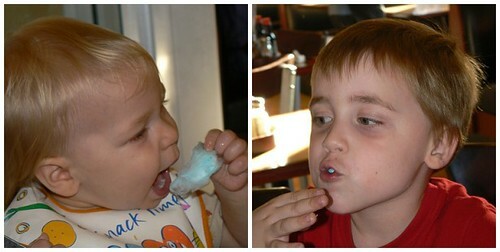 After our delicious meal (thank you Aunt S and Uncle M) we decided to order some cotton candy. I was convinced to let JSL try some of it. At first he did not want anything to do with it, he simply played. Check out what he created. Unfortunately for us, he soon discovered that the cotton candy was sweet and enjoyed it. Needless to say he was up quite late last night. Apparently the sugar rush got him, but not NHL. Here are both of the boys enjoying. We all want to wish Mimi a wonderful birthday. We are so glad that you live so close by. The boys and I love spending time with you. We hope to make many more special memories together for years to come. That looks like a lot of fun! 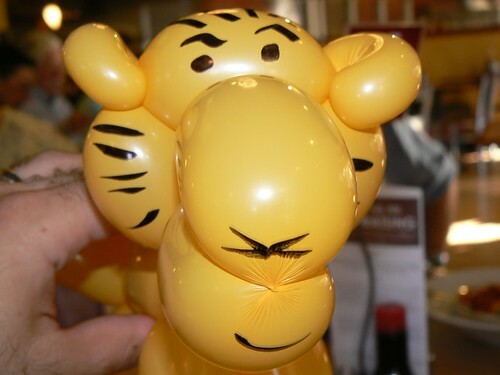 Mr Twisty is so talented…that balloon bears a striking resemblance to Tigger! I love that we are close to my husband’s grandparents too. Looks like she had a very special birthday! That is the coolest crown I’ve ever seen! HA! 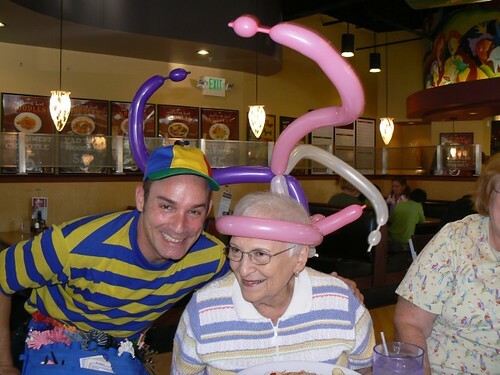 That picture of Mimi with the balloon hat is just perfect! Hope she had a happy day. Mimi looks like she’s such a character. How funny! Happy Birthday Mimi! Looks like an awesome time! I love the balloon shapes. 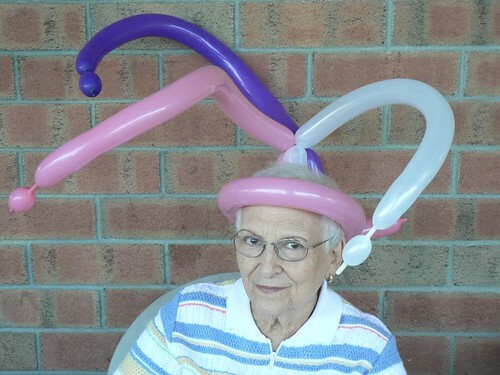 That is a GREAT birthday hat!